Ellen Worsdall creates and manages programs that enhance student experiences at McCormick. As the adviser to McCormick's student chapters of the National Society of Black Engineers (NSBE), the Society of Hispanic Professional Engineers (SHPE), and the Society of Women Engineers (SWE), she helps students create a community of support within the engineering school. 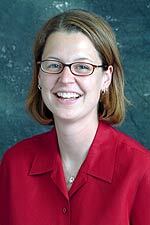 Worsdall began her career at Northwestern in 1998. She has a BA in English education from University of Toledo and an MS in higher education with a concentration in counseling from University of Wisconsin.